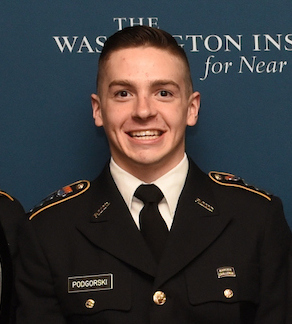 Along with his tuition scholarship from Macaulay Honors College, Drew Podgorski also was awarded a four-year Army ROTC National Scholarship right out of high school. The John Jay student is a member of that college’s first graduating class at Macaulay. Drew was inspired to join the ROTC by NY State Senator Greg Ball, who was a graduate of the Air Force Academy and with whom Drew had an internship. Other role models, like former Macaulay professor Army General David Petraeus inspired Drew to continue in military service. Drew has been a cadet at the CUNY Army ROTC program at City College, joining it in 2013, the first time it was re-instated since 1972. It opened Drew’s eyes to the diverse backgrounds of students at CUNY—all trying to meet the ROTC requirements while facing many personal challenges. Drew had a double major in Global Economics and Middle Eastern Relations, and he also received a CUNY BA, along with his Macaulay degree. His internship experiences led to his specialization in the technology sector and it all came together in his senior year when he completed his capstone project. The Brewster, NY native’s dad is a paramedic and his mom is a nurse, both of whom earned college degrees—and neither of whom was in the military. In summer 2017, Drew will go to Fort Knox for a month of culminating training and will commission as a Second Lieutenant, Infantry Officer in the Army National Guard upon completion of his training. He will also start his career as a technology investment banking analyst at Bowen Advisors. His most rewarding experience at Macaulay was taking Gen. Petraeus’ class, The North American Decades, a public policy course.